As the weather gets cooler I start to crave a yummy pot of soup. 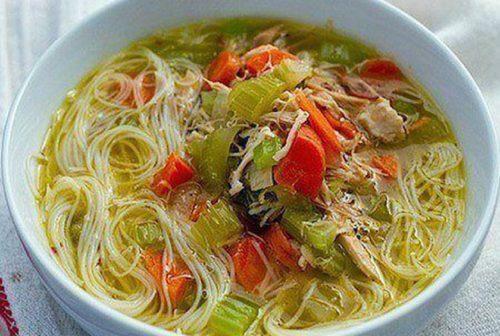 This chicken noodle soup is a favorite during the Fall. Add chicken breasts, broth, dill, and pepper to a large stock pot. Heat the pot over medium heat until it comes to a boil. Once it is boiling, put the lid on the stock pot, turn the stove down to low, and simmer for 30 minutes. In the meantime, chop your veggies. When the 30 minutes is up, add your onion, celery, and carrots to the pot, give it a stir, cover and let simmer for another 35 minutes. In a separate pot, boil about 6 cups of water. Once the water is boiling, turn off the heat and add your rice noodles. Let them soak in the hot water until they are soft, about 10 minutes. When the broth with the chicken and veggies is done simmering, add in the chard and the noodles (drain the water from them first). Stir and let cook for another 5 minutes, until the chard is wilted. Remove the chicken breasts from the soup, chop it up into bite sized pieces, and put it back into your stock pot. Adjust your seasonings to taste and enjoy!